Imagine if the University of Southampton staff and students together could raise £22,000 for charity in one week just by giving or raising £1 each? This is where The Big Give comes in! Throughout the week beginning 22nd April , the RAG (Raise and Give) team are hosting a whole week of opportunities that enable you to easily Raise or Give your £1 for charity. All of the money raised during this frenzied week of fundraising will be donated to some very worthwhile causes – Samaritans Southampton, Anthony Nolan Trust and WaterAid, which are our three nominated charities for this year! It’s a very ambitious target but we know we can do it, especially if we have YOUR help! 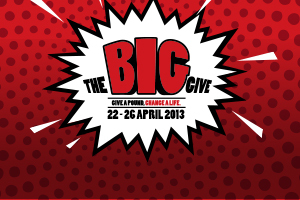 We need you to encourage everyone you know to do their bit and give just one pound! There will be teams collecting all across Highfield campus all week. If you’d like to donate online, or keep an eye on how we’re doing we’ll be updating our totals as we go – just check out the link www.charitygiving.co.uk/thebiggive. Plus, you can find out more and help spread the word via our Facebook event.